Be the first to share your favorite memory, photo or story of Nona . This memorial page is dedicated for family, friends and future generations to celebrate the life of their loved one. Born May 23, 1914 to William and Kate Mendenhall, Nona had 4 sisters and 4 brothers, all deceased. Nona married Robert E. Ballard on May 23, 1937. They had three children, Robert and Ronald Ballard and Sandra Miller, and four grandchildren. 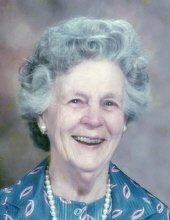 Nona attended school in Sheridan and Dallas, Oregon. She was a member of the McMinnville Women’s Garden Club, was President of McMinnville Women’s Club, member of Veterans of Foreign War Auxiliary, member of Eastern Star, Royal Matron of Amarath, and Mother Advisor of Rainbow for Girls for 18 years. The Assembly won many awards for skits and events at State Grand Assemblies. She was also active in Girl Scouts and Brownies. Nona had a Nursery School which she called “Aunt Nona’s Nursery School” for 30 years in McMinnville. Nona was on the first Board of Little Bear Hugs at the High School. She was appointed first handicapped children’s help in Yamhill County by the Governor of Oregon. Nona loved fishing, gardening, and her yard. She loved crafts of all kinds and made quilts, pottery and baskets. Nona loved to bring her neighbors together for potlucks and picnics. She loved people. She always helped older people who couldn’t get about. She was a row boss on farms all over the county. She had most of the kids in county in her fields at one time or another. She loved kids and was instrumental in helping them. Nona was preceded in death by a son, Robert Ballard who passed away in Missoula, MT in October, 2018 and by a daughter, Sandra Miller. Nona is survived by son, Ron Ballard of Lincoln City, two grandsons Brett Ballard of LaPine and Brennen Mendenhall of Missoula, and a granddaughter Lori Miller of Tigard. The family would like to thank Nona’s three wonderful caregivers, Peggy Morgan, Barbie Hamilton and Kristina Davis. To send flowers or a remembrance gift to the family of Nona Marie Mendenhall Ballard, please visit our Tribute Store. "Email Address" would like to share the life celebration of Nona Marie Mendenhall Ballard. Click on the "link" to go to share a favorite memory or leave a condolence message for the family.